Disclosure: Jay @Crafty Spices did receive a product for free and is sharing her personal opinion with all of us. Her opinion may differ from ours and yours. Neither Crafty Spices nor Java John Z's are responsible for sponsor prize shipment. Winner will be contacted by email and will have 48 hours to respond before another winner is selected. All entries will be verified. I love the giveaway item and the designer desk. I NEED THE LAPTOP DESK, SINCE DO HOMEWORK IN MY ROOM. I COULD USE A DESK LIKE THIS. THANK YOU. The tablet pillow makes a lot of sense. That would be a great product for us. I like the tablet pillow because my brother has an Ipad and could use this! I love the tablet pillows! The tablet pillow is really neat. I like the tablet pillow! I would use it all the time! the tablet pillows are really cool. I would like the tablet pillow the most. That tablet pillow looks interesting. The tablet pillow is a must have! I am interested in the Designer Series LapDesk or the Platinum Student LapDesk. I have an older laptop that I use, and I use a cooling pad, but would love a padded work area when I'm sitting on the couch. I also like the Deluxe Notebook LapDesk. 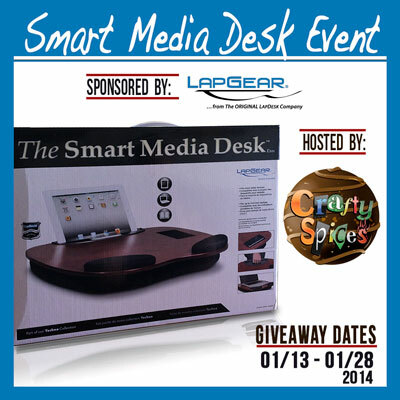 I WANT TO WIN THIS MEDIA DESK. LOOK VERY COOL. I really like the tablet pillow :) Great idea!